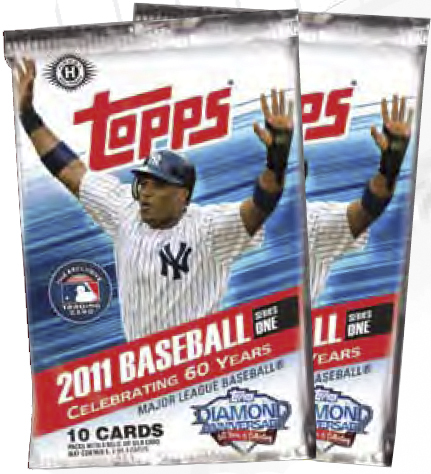 All About Sports Cards: Topps will give away special 1952 Topps Black Diamond Cards and Autographs with 2011 Baseball Series 1 wrapper redemption. Here's the info and checklists. Topps will give away special 1952 Topps Black Diamond Cards and Autographs with 2011 Baseball Series 1 wrapper redemption. Here's the info and checklists. 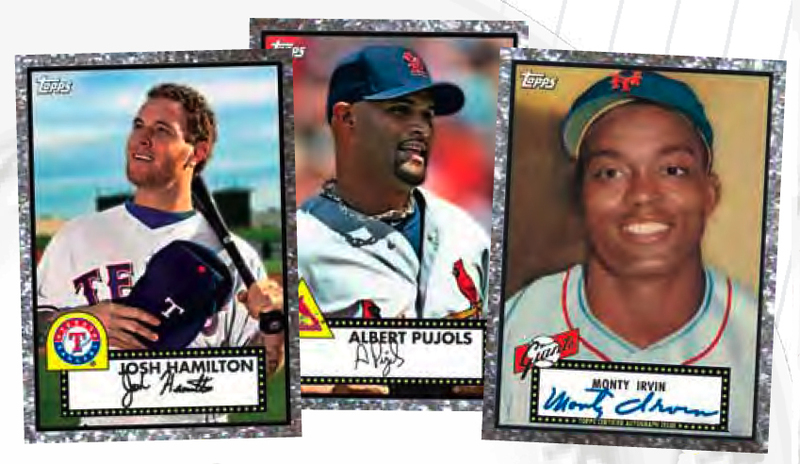 We told you in Sunday's post that Topps will be doing plenty of promotions associated with their 60th anniversary of baseball cards. Here is another one and its going to please a lot of you who collect Topps baseball cards. To launch and celebrate the 60th Anniversary of Topps Baseball Cards, there is going to be a special Hobby-Exclusive Wrapper Redemption Program for 2011 Topps Baseball Series 1. 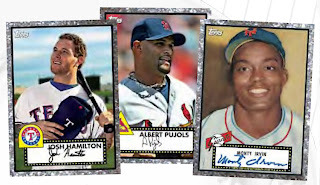 Collectors sending Topps 36 Hobby wrappers or 10 HTA Jumbo wrappers of 2011 Topps Series 1 will receive a special 5-card pack of 60th Anniversary Black Diamond cards. There will be 60 cards in all. In addition, Topps is seeding 34 different on-card Autograph cards (#’d to 60), featuring subjects from the original 1952 Topps set, into these 5-card packs. Here is a photo of what these cards will look like. The Josh Hamilton and Albert Pujols cards are from the black diamond cards set and the Monte Irvin is one of the randomly inserted on-card autos #/60. Pretty nice, huh? When you have your wrappers ready to go, you are encouraged to group them and send in 1 package. This Promotion ends August 1, 2011. Here is a checklist of all the cards. I like how Topps is doing this big! I was already planning on buying at least one hobby box...now I may go ahead and pick up 2. I love how they already have Dan Uggla as part of this set. The inclusion of Martin Prado is also a (pleasant) surprise. Cubs representatives: Starlin Castro & Roy Smalley. ARE YOU KIDDING ME? !